A national database of real estate offices where agents can vet clients is poised for nationwide growth. Eight state Realtor associations have signed up to encourage their members to participate in the program, including the California Association of Realtors. Real Agent Guard, which powers the national database for free, offers other, paid agent-safety products. The California Association of Realtors and seven other state Realtor associations have signed up to promote the free agent-safety “Realtor Safe Harbor” program, which encourages brokerages, lenders and title companies to open their offices to agents who want to vet clients they’re meeting for the first time. On realtorsafeharbor.com and its associated iOS and Android mobile apps, agents can search a national database to find nearby real estate offices where they can safely meet a client. With nine additional state Realtor associations poised to come on board, the program expects to have nationwide coverage within three months, said Justyn Hornor, co-founder of the agent-security tech firm behind the program, Real Agent Guard. The database still has a ways to go. Just 70 brokerage offices and 120 title and lender offices have signed up in the database. But Hornor expects those numbers to grow rapidly once the newly signed-up associations have an opportunity to promote the program to their memberships. When firms take the “Safe Harbor” pledge, they make their offices available to agents for meeting with a new client and agree to provide a one-page client prospect form. Another program, Open Door Partners, is building a similar database. The two will likely merge when it makes sense, according to Seattle broker Sam DeBord, who’s spearheading Open Door Partners. 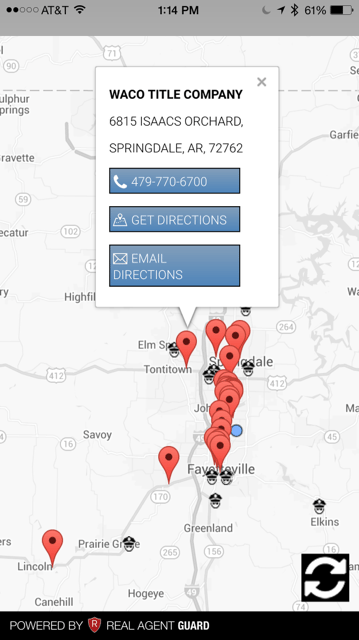 While Rogers, Arkansas-based Real Agent Guard provides the Realtor Safe Harbor platform for free, it also has two paid products: a service, Real Agent Guard, that alerts agents’ networks when they fail to shut off a safety timer before it expires; and a live video feed product that allows their brokerage or team to monitor them in an open house with live video feeds from a laptop. Since the Real Agent Guard service lives on the cloud and not on an agent’s phone, it can’t be disabled by just turning a phone off or destroying it. For small brokerages and associations, the app goes for $2 to $3 per agent per month. For enterprise accounts, that price drops down to a monthly fee of 80 cents per agent. The Northwest Arkansas Association of Realtors has an enterprise account. Individual agents can also purchase the service for $5 per month. In this case, they can set their friends and family up to receive an alert. Other apps designed to help agents reduce safety risks include SafeTrek, Verify Photo ID, Agent.Watch and Secure Show. For the live video service, the firm charges brokerages a flat fee of $20 per month. Agents set up a laptop in their open house and use a mobile hot spot to beam the video feed to their brokerage. Hornor said the Safe Harbor platform will always be free. The California Association of Realtors is exploring whether to fully endorse the “Realtors Safe Harbor” program, according to a spokeswoman for the association. Currently, the association’s tangentially promoting it through a sponsorship by the Real Agent Guard, which offers its app to association members at a discount. The other seven state associations — including Arkansas, Wyoming, Louisiana and Idaho — have more fully embraced the program by formally incorporating it into their safety programs. Editor’s note: This story has been updated to clarify that the California Association of Realtors is evaluating whether to directly endorse the “Realtors Safe Harbor” program; it currently promotes the program indirectly by marketing the Real Agent Guard app to its members.